The Lille metro entered its name in the record books for, it was the first metro station in the world to use the VAL system. With a grand entrance, the metro began operations in the year 1983. With the VAL system in use, it was the only metro system to boast a fully automated driverless metro, in the whole of Europe. Connecting the suburbs with the city center, the 45 km long system runs on 2 lines, serving 60 stations in total. It proves to be an important means of public transport along with the busses and trams in Lille and boasts of an annual ridership of $99 million (2011). The metro begins operations at around 05:00 am in the morning and runs till sometime after midnight. Usually, the last trains are between 00:00-00:45 am On Sundays and other holidays, things start a little bit later at 06:30 am. It is one of the quickest metro service in the world. With a maximum headway of just 8 minutes, during peak hours things go really quick, with a train literally every minute. Note: Lines M1 and M2, are the names of the 2 metro lines. Travelling in public transportation in Lille is convenient, partly because of their ‘Pass Pass System’ in operation. There are primarily three options; Une Carte Personnelle, Une Carte Non Personnalisee and Un Ticket Rechargeable. The Une Carte Personnelle, provides access to all subscriptions and services provided by Transpole. This card allows one to load all subscriptions along with, casual titles provided by Transpole. One more advantage of it is that in case of theft it can be recovered for a maximum fee of 8 Euros. A personal pass costs 4 Euros. The Une Carte Non Personnalisee, allows one to load several titles, but titles only. An added perk of this card is that since it’s not registered, you can lend it to friends or family. A card costs 2 Euros. The Un Ticket Rechargeable, is for those people who use public transportation only occasionally. You can load a category of casual titles. It can be used multiple time and since it too, is not registered, you can lend it to anyone. It costs just 0.20 Euros, as first price purchase. The city of Lille has adequate parking lots to make use of the park and ride facilities, that is offered by their public transportation. Primarily these spaces are available close to metro stations, bus stops and tram stations. One important thing to remember is that, vehicles cannot be left in the lots overnight. The Metro system of Lille serves as a connection between a number of suburbs and the city center. It forms an integral part of the multi-modal public transportation network in the city that covers almost the entire Metropolitan area of Lille. The Metro is operated along with trams and buses under the public transportation brand Transpole. The second of the two Metro lines was completed and opened to commuters in 1989 while the first one had been in operation since 1984. Line 1 covers a distance of nearly fourteen kilometers and is served by eighteen stops along the route. 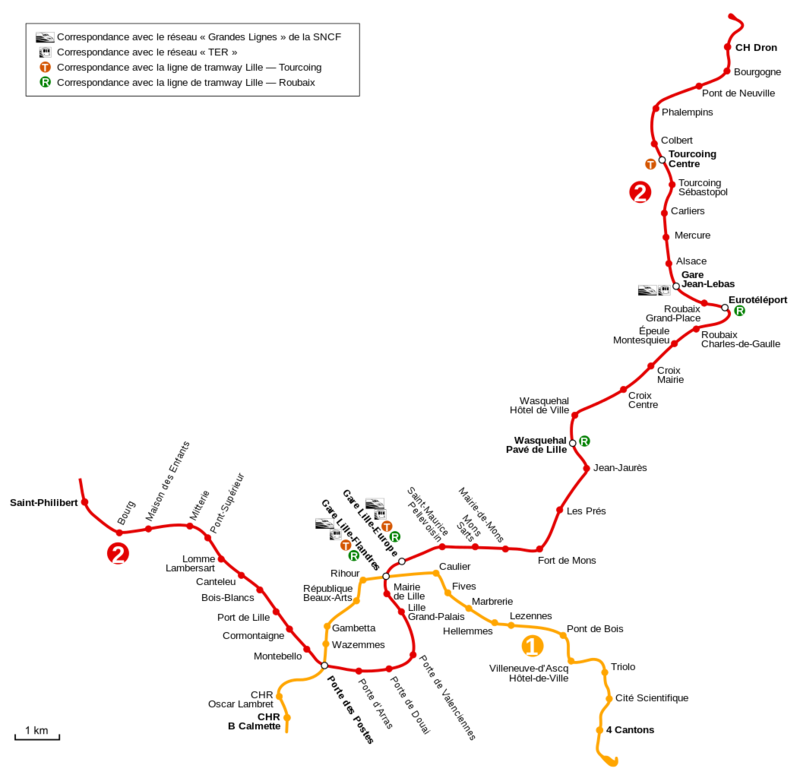 Line 2, on the other hand, was further extended upto the Belgian border in 2000, making it a route covering a distance of thirty-two kilometers with as many as forty-three stops along the length of the journey. Map of Lille Metro showing various lines and stations. Click on the map to enlarge it or Download Lille Metro Map in PDF.